If you’re heading to Zion National Park, I’ve got a sweet map with a guide on the back to help you make the most of your trip. Last year, in response to all of the requests that I get for people traveling to Glacier, I came out with the Day Hikes of Glacier National Park Map Guide to answer the question, “Where should I hike today?” The response has been overwhelming, so I decided to fill that void at other National Parks. First up is Zion National Park. It’s not a book, but a waterproof, tear resistant map with a full day hiking guide on the back. It also includes hiking recommendations to help you sort through the overwhelming amount of information that happens when you visit a new National Parks. The map is perfect for hiking or backpacking with distances between junctions and a visual way of seeing how steep a trail is with green being level, yellow being an incline, and red being steep. 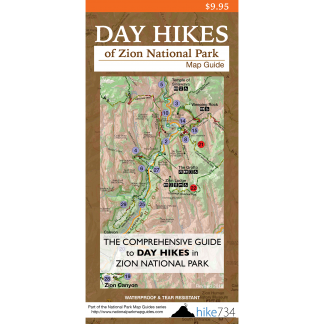 For a free online version of just the guide, check out the Day Hiking in Zion page. Jake, do you work for the National Park Service? Checking to see if your site is secure. I used your maps for Glacier backpacking in 2016; they are great. We are going to Zion for the first time on Feb 15, 2018. We are from Illinois and it is not always easy to get to the mountains. Is your Zion Hike Guide available to buy at the park or anywhere else? And when will you have the Zion map available in 2018? I would really like to get one. Thank you, we really enjoy your guides and maps. Hello Carol! My new map will be available in April which will miss your trip. You can either wait and pick up one at the Visitor Center down there or order one from Amazon as there is a few left in stock there. Have a great trip! !